"Alaska Pipeline" redirects here. For the proposed natural gas pipeline from Alaska to Alberta, see Alaska gas pipeline. The Trans-Alaska Pipeline System (TAPS) includes the trans-Alaska crude-oil pipeline, 11 pump stations, several hundred miles of feeder pipelines, and the Valdez Marine Terminal. TAPS is one of the world's largest pipeline systems. It is commonly called the Alaska pipeline, trans-Alaska pipeline, or Alyeska pipeline, (or the pipeline as referred to in Alaska), but those terms technically apply only to the 800 miles (1,287 km) of the pipeline with the diameter of 48 inches (1.22 m) that conveys oil from Prudhoe Bay to Valdez, Alaska. The crude oil pipeline is privately owned by the Alyeska Pipeline Service Company. The pipeline was built between 1974 and 1977, after the 1973 oil crisis caused a sharp rise in oil prices in the United States. This rise made exploration of the Prudhoe Bay oil field economically feasible. Environmental, legal, and political debates followed the discovery of oil at Prudhoe Bay in 1968, and the pipeline was built only after the oil crisis provoked the passage of legislation designed to remove legal challenges to the project. In building the pipeline, engineers faced a wide range of difficulties, stemming mainly from the extreme cold and the difficult, isolated terrain. The construction of the pipeline was one of the first large-scale projects to deal with problems caused by permafrost, and special construction techniques had to be developed to cope with the frozen ground. The project attracted tens of thousands of workers to Alaska, causing a boomtown atmosphere in Valdez, Fairbanks, and Anchorage. The first barrel of oil traveled through the pipeline in the summer of 1977,     with full-scale production by the end of the year. Several notable incidents of oil leakage have occurred since, including those caused by sabotage, maintenance failures, and bullet holes. As of 2010, the pipeline had shipped almost 16 billion barrels (2.5×109 m3) of oil. Iñupiat people on the North Slope of Alaska had mined oil-saturated peat for possibly thousands of years, using it as fuel for heat and light. Whalers who stayed at Point Barrow saw the substance the Iñupiat called pitch and recognized it as petroleum. Charles Brower, a whaler who settled at Barrow and operated trading posts along the arctic coast, directed geologist Alfred Hulse Brooks to oil seepages at Cape Simpson and Fish Creek in the far north of Alaska, east of the village of Barrow. Brooks' report confirmed the observations of Thomas Simpson, an officer of the Hudson's Bay Company who first observed the seepages in 1836. Similar seepages were found at the Canning River in 1919 by Ernest de Koven Leffingwell. Following the First World War, as the United States Navy converted its ships from coal to fuel oil, a stable supply of oil became important to the U.S. government. Accordingly, President Warren G. Harding established by executive order a series of Naval Petroleum Reserves (NPR-1 through -4) across the United States. These reserves were areas thought to be rich in oil and set aside for future drilling by the U.S. Navy. Naval Petroleum Reserve No. 4 was sited in Alaska's far north, just south of Barrow, and encompassed 23,000,000 acres (93,078 km2). Other Naval Petroleum Reserves were embroiled in controversy over government corruption in the Teapot Dome Scandal. In 1969, Humble Oil and Refining Company sent a specially fitted oil tanker, the SS Manhattan, to test the feasibility of transporting oil via ice-breaking tankers to market. The Manhattan was fitted with an ice-breaking bow, powerful engines, and hardened propellers before successfully traveling the Northwest Passage from the Atlantic Ocean to the Beaufort Sea. During the voyage, the ship suffered damage to several of its cargo holds, which flooded with seawater. Wind-blown ice forced the Manhattan to change its intended route from the M'Clure Strait to the smaller Prince of Wales Strait. It was escorted back through the Northwest Passage by a Canadian Coast Guard icebreaker, the CCGS John A. Macdonald. Although the Manhattan transited the Northwest Passage again in the summer of 1970, the concept was considered too risky. A pipeline was thus the only viable system for transporting the oil to the nearest port free of pack-ice, almost 800 miles (1,300 km) away at Valdez. 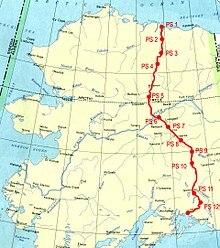 In February 1969, before the SS Manhattan had even sailed from its East Coast starting point, the Trans-Alaska Pipeline System (TAPS), an unincorporated joint group created by ARCO, British Petroleum, and Humble Oil in October 1968,  asked for permission from the United States Department of the Interior to begin geological and engineering studies of a proposed oil pipeline route from Prudhoe Bay to Valdez, across Alaska. Even before the first feasibility studies began, the oil companies had chosen the approximate route of the pipeline. Permission was given, and teams of engineers began drilling core samples and surveying in Alaska. Udall imposed the freeze on any projects involving land claimed by Alaska Natives in hopes that an overarching Native claims settlement would result. In the fall of 1969, the Department of the Interior and TAPS set about bypassing the land freeze by obtaining waivers from the various native villages that had claims to a portion of the proposed right of way. By the end of September, all the relevant villages had waived their right-of-way claims, and Secretary of the Interior Wally Hickel asked Congress to lift the land freeze for the entire TAPS project. After several months of questioning by the House and Senate committees with oversight of the project, Hickel was given the authority to lift the land freeze and give the go-ahead to TAPS. Opposition to construction of the pipeline primarily came from two sources: Alaska Native groups and conservationists. Alaska Natives were upset that the pipeline would cross the land traditionally claimed by a variety of native groups, but no economic benefits would accrue to them directly. Conservationists were angry at what they saw as an incursion into America's last wilderness. [ according to whom?] Both opposition movements launched legal campaigns to halt the pipeline and were able to delay construction until 1973. 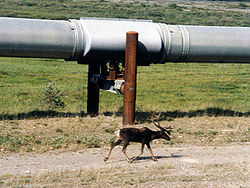 A caribou walks next to a section of the pipeline north of the Brooks Range. Opponents of the pipeline asserted the presence of the pipeline would interfere with the caribou. The pipeline interferes with Caribou migration routes but crossing points were installed to help limit disruption. The oil industry and pipeline also provides money to help protect the local animal habitats and environment. 6-16 billion barrels of oil lies underneath the ANWR. However, the U.S. Senate blocked the proposal to drill under this protected area. The pipeline passes underneath many smaller rivers and streams, but bridges cover longer crossings. On October 17, 1973, the Organization of Arab Petroleum Exporting Countries announced an oil embargo against the United States in retaliation for its support of Israel during the Yom Kippur War. Because the United States imported approximately 35 percent of its oil from foreign sources,  the embargo had a major effect. The price of gasoline shot upward, gasoline shortages were common, and rationing was considered. Most Americans began demanding a solution to the problem, and President Richard Nixon began lobbying for the Trans-Alaska Pipeline as at least a part of the answer. The pipeline is on slider supports where it crosses the Denali Fault. The construction of the Trans-Alaska Pipeline System and its completion in 1977 had an immense effect on Alaska, the United States, and the rest of the world. Its impact has included economic, physical, and social repercussions running the gamut from life in small towns to the global oil market. Water overflowed the banks of the Chena River in August 1967, flooding Fairbanks and Fort Wainwright. Alaska oil production peaked in 1988. The Alistair Maclean novel, "Athabasca", published 1980, also deals with a sabotage threat against both the Alaska Pipeline and the Athabasca tar sands in Canada. The pipeline has also inspired various forms of artwork. The most notable form of art unique to the pipeline are pipeline maps—portions of scrap pipe cut into the shape of Alaska with a piece of metal delineating the path of the pipeline through the map. Pipeline maps were frequently created by welders working on the pipeline, and the maps were frequently sold to tourists or given away as gifts. Other pipeline-inspired pieces of art include objects containing crude oil that has been transported through the pipeline. Migrant Workers take the majority of jobs created by the pipeline, this causes dispute and hostility between migrant communities and local Inuit people. However, many local Inuit rely on the pipeline and oil industry for income. It is also a source of heat and energy for locals. This scraper pig was retired from use in the pipeline and is on display. ^ a b "'Pig' leading flow of oil in pipeline". Eugene Register-Guard. (Oregon). UPI. June 20, 1977. p. 1A. ^ a b "Hot North Slope oil flowing". Spokane Daily Chronicle. (Washington). Associated Press. June 20, 1977. p. 1. ^ a b c d e "Valdez celebrates arrival of first oil". Eugene Register-Guard. (Oregon). Associated Press. July 29, 1977. p. 1A. ^ "Tanker casts off with load of oil". Eugene Register-Guard. (Oregon). wire services. August 2, 1977. p. 3A. ^ Leffingwell, E.d. "The Canning River region, northern Alaska: U.S. Geological Survey Professional Paper 109", U.S. Geological Surveye. 1919. Accessed June 14, 2009. ^ Bird, Kenneth J. and Houseknecht, David W. "2002 Petroleum Resource Assessment of the National Petroleum Reserve in Alaska (NPRA)", USGS. 2002. Accessed June 14, 2009. ^ Gedney, Larry and Helfferich, Merritt. "Voyage of the Manhattan" Archived February 13, 2005, at the Wayback Machine, Alaska Science Forum. December 19, 1983. Accessed June 14, 2009. ^ Kavanagh, Dave. "S.S. Manhattan & the Northwest Passage", sunshiporg.homestead.com. July 12, 2005. Accessed June 14, 2009. ^ Cole, p. 17---> No full source for this? Two different Coles listed on the page. ^ Taylor, Susan. "Claims Bill Disappointing: Strong General Note of Dissatisfaction on Latest Claims Bill", The Tundra Times. May 20, 1970. Accessed June 18, 2009. ^ Wald, Matthew (April 30, 1989). "Oil Means Comfort to Alaska Natives but Peril to Their Culture". New York Times. Retrieved November 30, 2017. ^ The Tax Foundation. "Alaska's State and Local Tax Burden, 1977–2008", Tax Data. Accessed July 28, 2009. ^ a b Alaska Humanities Forum. "Modern Alaska: Alaska Permanent Fund" Archived March 3, 2016, at the Wayback Machine, akhistorycourse.org. Accessed July 28, 2009. ^ Editorial. "Pipeline payments", Fairbanks Daily News-Miner. June 21, 2009. Accessed July 28, 2009. ^ Alan Austerman. "Alaska Permanent Fund history recapped", akrepublicans.org. May 5, 1999. Accessed July 28, 2009. ^ a b Energy Information Administration. "Crude Oil Prices by Selected Type, 1970–2009", EIA.doe.gov. Accessed July 29, 2009. ^ American Petroleum Institute. "History of Northern Alaska Petroleum Development", API.org. Accessed July 29, 2009. ^ National Energy Technology Laboratory. "Fossil Energy – Alaska Oil History" Archived April 25, 2009, at the Wayback Machine, Arctic Energy Office. Accessed July 29, 2009. ^ The Internet Movie Database. "Plot summary for On Deadly Ground", IMDB.com, Accessed July 29, 2009. ^ The Internet Movie Database. "Synopsis for 30 Days of Night", IMDB.com, Accessed July 29, 2009. ^ Nelson, Kristen. "Kuparuk Anniversary", Petroleum News. January 27, 2007. Vol. 12, No. 3. Accessed July 15, 2009. ^ Delbridge, Rena. "BP begins development of Liberty oil field project on North Slope" Archived August 28, 2009, at the Wayback Machine, Fairbanks Daily News-Miner. July 14, 2008. Accessed July 15, 2009. ^ a b Delbridge, Rena. "Alyeska Pipeline retooling as North Slope oil production declines" Archived July 11, 2009, at Archive.today, Fairbanks Daily News-Miner. April 27, 2009. Accessed July 15, 2009. ^ a b c d Alan Bailey (January 15, 2012). "A TAPS bottom line". Petroleum News. Retrieved October 27, 2012. ^ How Do Pumping Stations Work?. Rigzone. ^ Carber, Kristine M. "Scanning the Alaska Pipeline", Point of Beginning. December 1, 2006. Accessed July 30, 2009. ^ Roehner, R.M., Fletcher, J.V., and Hanson, F.V. "Comparative Compositional Study of Crude Oil Solids from the Trans Alaska Pipeline System Using High-Temperature Gas Chromatography", Energy Fuels. 2002, 16 (1), pp. 211–217. ^ a b Bohman, Amanda. "Trans-Alaska oil pipeline shut down for maintenance"[ permanent dead link], Fairbanks Daily News-Miner. July 19, 2009. Accessed July 29, 2009. ^ Exxon Valdez Oil Spill Trustee Council. "Questions and Answers", Evostc.state.ak.us. Accessed July 17, 2009. ^ D'Oro, Rachel. "Twenty years later, Exxon Valdez disaster's effects linger" Archived August 28, 2009, at the Wayback Machine, Fairbanks Daily News-Miner. March 24, 2009. Accessed July 16, 2009. ^ "Explosion ruptures trans-Alaska pipeline". Eugene Register-Guard. (Oregon). wire services. July 9, 1977. p. 1A. ^ "Bypass of break held possible". Spokane Daily Chronicle. (Washington). Associated Press. July 9, 1977. p. 1. ^ "Probers Blame Workers for Pipeline Explosion". Herald Journal. Associated Press. July 20, 1977. Retrieved November 24, 2012. ^ "Safety Recommendation(s)" (PDF). National Transportation Safety Board. December 13, 1977. Archived from the original (PDF) on October 8, 2012. Retrieved November 24, 2012. ^ Shinohara, Rosemary (August 25, 1977). "Report Faults Pipeline Fire System". Anchorage Daily News. Archived from the original on July 17, 2012. Retrieved November 24, 2012. ^ The Associated Press. ["Pipeline sabotage investigated"], Ocala Star-Banner. February 16, 1978. Accessed July 16, 2009. ^ Clark, Maureen. "Pipeline pierced by bullet" Archived March 6, 2016, at the Wayback Machine, Juneau Empire. October 5, 2001. Accessed July 16, 2009. ^ BBC News. "Alaska clean-up 'could take years'", news.bbc.co.uk. October 7, 2001. Accessed July 16, 2009. ^ Staff report. "A drunk, a gun and a pipeline with a hole", The Times. April 9, 2004. Accessed July 16, 2009. ^ AP News/Huffington Post; (May 26, 2010). "Alaska Oil Spill: Trans-Alaska Pipeline Shuts Down 800 Mile Area In North Slope". AP/Huffington Post. Retrieved July 29, 2010. ^ Alaska Department of Environmental Conservation. "Unified Command – Pump Station 1 Booster Incident". Archived from the original on July 21, 2011. Retrieved January 16, 2011. ^ Lisa Demer (January 12, 2011). "Cold forces temporary restart of trans-Alaska oil pipeline". Anchorage Daily News. Archived from the original on January 19, 2011. Retrieved January 16, 2011. ^ Hostler, Kevin. "Offshore work is essential for pipeline’s future" Archived August 28, 2009, at the Wayback Machine, Fairbanks Daily News-Miner. April 10, 2009. Accessed July 15, 2009. ^ National Energy Technology Laboratory. "Fossil Energy – Trans-Alaska Pipeline System" Archived December 5, 2008, at the Wayback Machine, Arctic Energy Office. Accessed July 29, 2009. ^ Trans-Alaska Pipeline System Renewal Environmental Impact Statement. "Trans Alasaka Pipeline System Throughput Analysis" Archived December 28, 2016, at the Wayback Machine. Accessed March 28, 2010. ^ Fineberg Research Associates. "Trans-Alaska Pipeline System Dismantling, Removal and Restoration (DR&R): Background Report and Recommendations" (PDF), Prince William Sound Regional Citizens’ Advisory Council. June 24, 2004. Accessed July 29, 2009. Alyeska Pipeline Service Co. The Facts: Trans Alaska Pipeline System (PDF). Alyeska Pipeline Service Co., 2007. Banet, Arthur C. "Oil and Gas Development on Alaska's North Slope: Past Results and Future Prospects" (PDF). Bureau of Land Management, March 1991. Berry, Mary Clay. Alaska Pipeline: The Politics of Oil and Native Land Claims. Indiana University Press, 1975. Coates, Peter A. The Trans-Alaska Pipeline Controversy. University of Alaska Press, 1991. Cole, Dermot. Amazing Pipeline Stories. Kenmore, Washington; Epicenter Press, 1997. McGrath, Ed. Inside the Alaska Pipeline. Millbrae, California; Celestial Arts, 1977. Mead, Robert Douglas. Journeys Down the Line: Building the Trans-Alaska Pipeline. Doubleday, 1978. Naske, Claus M. and Slotnick, Herman E. Alaska: A History of the 49th State. Norman, Oklahoma; University of Oklahoma Press, 1987. Second edition. Roscow, James P. 800 Miles to Valdez: The Building of the Alaska Pipeline. Englewood Cliffs, N.J.; Prentice-Hall Inc., 1977. Wickware, Potter. Crazy Money: Nine Months on the Trans-Alaska Pipeline. New York; Random House, 1979. Allen, Lawrence J. The Trans-Alaska Pipeline. Vol 1: The Beginning. Vol 2: South to Valdez. Seattle; Scribe Publishing Co. 1975 and 1976. Alyeska Pipeline Service Co. Alyeska: A 30-Year Journey. Alyeska Pipeline Service Co., 2007. Baring-Gould, Michael and Bennett, Marsha. Social Impact of the Trans-Alaska Oil Pipeline Construction in Valdez, Alaska 1974–1975. Anchorage; University of Alaska Anchorage, 1976. Brown, Tom. Oil on Ice: Alaskan Wilderness at the Crossroads. Edited by Richard Pollack. San Francisco; Sierra Club Battlebook, 1980. Dixon, Mim. What Happened to Fairbanks? The Effects of the Trans-Alaska Oil Pipeline on the Community of Fairbanks, Alaska. Social Impact Assessment Series. Boulder, Colorado; Westview Press, 1978. Dobler, Bruce. The Last Rush North. Boston; Little, Brown and Co., 1976. Fineberg, Richard A. A Pipeline in Peril: A Status Report on the Trans-Alaska Pipeline. Ester, Alaska; Alaska Forum for Environmental Responsibility, 1996. Hanrahan, John and Gruenstein, Peter. Lost Frontier: The Marketing of Alaska. New York; W.W. Norton, 1977. Kruse, John A. Fairbanks Community Survey. Fairbanks; Institute of Social and Economic Research, 1976. LaRocca, Joe. Alaska Agonistes: The Age of Petroleum: How Big Oil Bought Alaska. Rare Books, Inc. 2003. Lenzner, Terry F. The Management, Planning and Construction of the Trans-Alaska Pipeline System. Washington, D.C.; Report to the Alaska Pipeline Commission. Manning, Harvey. Cry Crisis! Rehearsal in Alaska (A Case Study of What Government By Oil Did to Alaska and Does to the Earth). San Francisco; Friends of the Earth, 1974. McGinniss, Joe. Going to Extremes. New York; Alfred A. Knopf, 1980. McPhee, John. Coming Into the Country. New York: Farrar, Straus and Giroux, 1976. Miller, John R. Little Did We Know: Financing the Trans Alaska Pipeline. Cleveland: Arbordale LLC, 2012. Romer, John and Elizabeth. The Seven Wonders of the World: A History of the Modern Imagination. New York; Henry Holt and Co., 1995. Simmons, Diane. Let the Bastards Freeze in the Dark. New York; Wyndham Books, 1980. Strohmeyer, John. Extreme Conditions: Big Oil and the Transformation of Alaska. New York; Simon & Schuster, 1993. Wolf, Donald E. Big Dams and Other Dreams: The Six Companies Story. Norman, Oklahoma. University of Oklahoma Press, 1996. Yergin, Daniel. The Prize: The Epic Quest for Oil, Money and Power. New York; Simon & Schuster, 1991. Armstrong, John. Pipeline Alaska. Pelican Films, 1977. Davis, Mark. The American Experience: The Alaska Pipeline. PBS, Season 18, Episode 11. April 24, 2006. World's Toughest Fixes: Alaska Oil Pipeline. National Geographic Channel. Season 2, Episode 10. August 20, 2009. Wikimedia Commons has media related to Trans-Alaska Pipeline System.